I haven’t finished my holiday yet …. To all I wish a Happy New Year. A character in one of my pieces of writing is spring-stepping along forest floors, thinking that at least the local flora and fauna and the swaying canopy of leaf and of cloud are all heeding his song. He has not long got out of his raggedy clothing, and has learned to look as normal as he can, back in polite society. The poor and outcast taught him how to be more simple. They saved his heart from being almost a stone. He saw how they shared what little they had. He saw how little it takes to assist the downtrodden to become confident, and the light of well-being and intelligence to shine in their eyes. What should have filled him with so much sorrow has given him a joy that hardly ever leaves him. He is ridiculous as the world knows it. 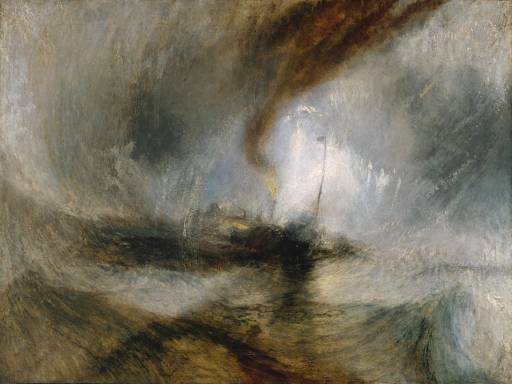 Relating to the song below, you can see below my favourite painter William Turner’s painting “Snow Storm – Steam-Boat off a Harbour’s Mouth“. The apparently apocryphal story is that to assist in the painting of this picture, Turner actually had himself tied to the mast of a ship in a storm. In this steady state, he was able to ride out the storm. Apocryphal or not, the notion is a great one. Have you seen how early the no-sayers get started? But will you drink? Will you sink a syringe?! (Lift) Will we belly-roll for the no-sayers; let them ravage us? Will we savage ourselves because of savages?! You can ride storms as if you’re made of cork? When your Captain is your own self-talk? Have you seen how early they get started?